This past winter, Black Diamond Skis stepped up their touring game with the introduction of the Efficient Series. This coming winter, the 2011–2012 season, Black Diamond skis are getting a new dose of power and science, with a full redesign and launch of the BD’s Power Series skis. According to the brand, the Black Diamond 2011 mission for this fall’s ski launch is to unite freeride power with backcountry-inspired agility. Drawing on their thirst for “ski-ence,” the melding of science and skiing, or bringing together function and freeride culture, 2011 Black Diamond Skis are rock solid and have some of the best graphics we’ve seen to boot. 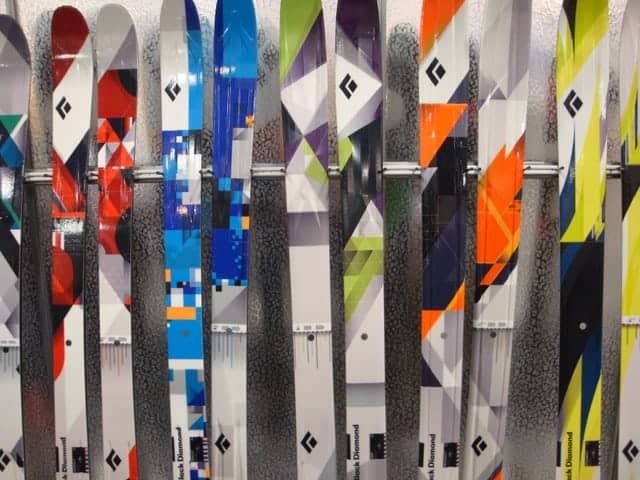 There are 5 brand-new skis in the Black Diamond 2011 line, plus 4 major redesigns. 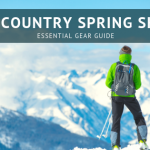 Below, I provide a quick sneak peek at what’s new, along with some video footage I took at Outdoor Retailer of the BD marketing folks walking me through the line. 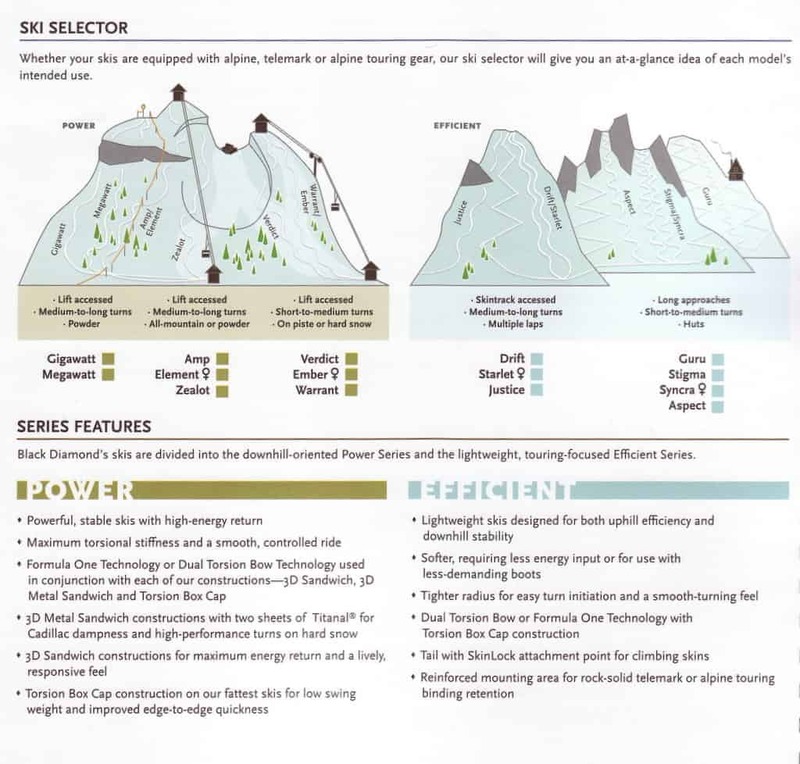 But if you’re a Black Diamond newbie, and Power and Efficient series mean nothing to you, take a look at this Ski Selector. It should give you a good idea of the two series, and which Black Diamond skis fall where. Now on to the NEW! Here’s the run-down for the Black Diamond 2011 line, with most of the updates occuring in the Power Series. 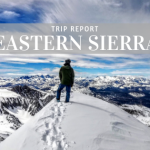 Black Diamond views rocker as a versatile tool, so you’ll find rocker and semi-rockered tips and tails on virtually every new model, except for the Warrant and Ember. NEW: The Black Diamond Gigawatt (163-135-141) usurps the Megawatt’s title as the biggest, fattest Black Diamond ski. These full-rocker beasts cater to powder skiers, offering a longboard feel with big mountain stability. Yet they’re lively and responsive, with a quick edge-t0-edge that’s essential for such a large ski. UPDATED: The legendary Black Diamond Megawatt (178 cm: 145-120-126) is redesigned with a stiffer tip, slightly longer contact length and a tighter turn radius to make tight tree runs and wide open arcs even more intuitive and fun. NEW: The Black Diamond Amp (175 cm: 141-115-123) moves into that versatile spot in the Power Series line (with the Justice moving to the Efficient Series, see below). Though big-mountain inspired, the Amp’s hybrid shape is great for progressing in nearly every venue. UPDATED: The Black Diamond Zealot (182 cm: 135-110-123) gets a new 3D Metal Sandwich construction to damp it down, with an ultralight paulownia wood core. Known as the big gun with a playful side, the Zealot is all about fun freeride. UPDATED: The Black Diamond Verdict (180 cm: 134-102-121) also gets the new 3D Metal Sandwich construction to bring it up a notch in edge hold and terrain-absorbing dampness. This is the ski for chargers who need something to hold up in variable conditions. NEW: If you’re a no-frills skier who’s looking for one tool to do it all, the quick and lively new Black Diamond Warrant (178 cm: 130-95-118) is your ski. Its wide, soft-flexing tip and 3D Sandwich construction make for easy turns and the control you need in any condition. NEW | WOMEN’S SPECIFIC: The Black Diamond Element (165 cm: 139-115-123) is the Amp’s ripping sister. Big-mountain inspired with a hybrid shape tailored to a woman’s proportions, the new Element floats in the deep, yet is carvy and agile in firmer conditions. NEW | WOMEN’S SPECIFIC: The Black Diamond Ember (158 cm: 126-95-115) mirrors the philosophy behind the new Warrant. It’s an everyday ski for those who only need a quiver of one. Easy turns are facilitated by 3D Sandwich construction and a wide, soft-flexing tip. UPDATED: The popular Black Diamond Justice (175 cm: 138-111-123) hangs with a new crowd this season, moving into the touring-based Black Diamond Efficient Series. 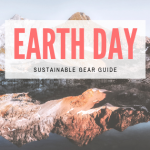 A redesign with powder-specific geometry and a lightweight paulownia wood core makes this semi-rockered favorite great on and off the skin track. With Black Diamond Skis 2011, the brand had two key goals: for each ski to be stable and powerful, yet remarkably easy to ski. Once we try them out, and get the skis in our shop, we’ll update this post with links to buy and write new reviews on individual models. Until then, enjoy the eye candy and start saving for your perfect pair. 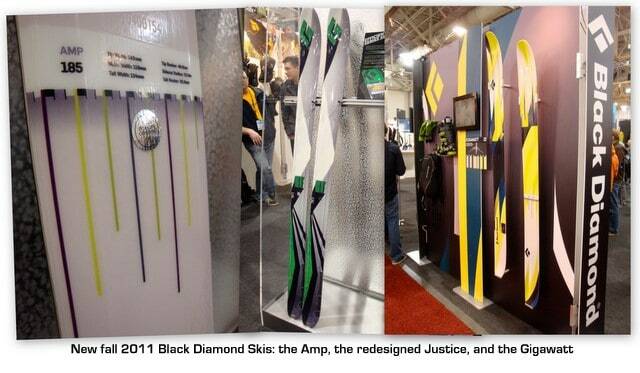 We expect these new Black Diamond skis to fly off our shelves come fall 2011.